Fury Fighting Championship brings an early Sunday, September 2 card to Cowboys Dancehall in San Antonio, Tx. The Fury FC 26 card will be headlined with Washington Luiz defending his Fury FC welterweight title against Anthony Ivy. 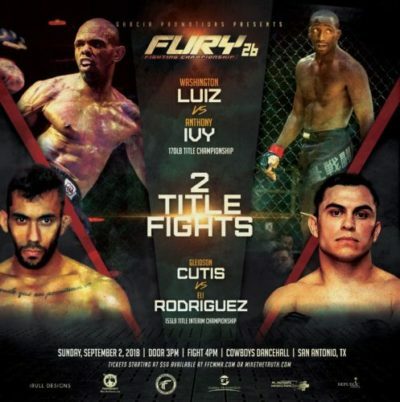 Luiz captured the Fury Fighting Championship title at Fury FC 23 with a TKO win over Chris Lopez, while his opponent, Anthony Ivy, who competed on that same card, earned his shot with a first round submission over Derrick Ageday. You can check out the rest of the card below. You can also purchase Fury FC 26 tickets here at MikeTheTruth.com.